Between the cuatro gatos, my mother’s ongoing deterioration, adjusting to the new realities of Arnold as a “forever” cardiac patient, we have been just twitching from stress. We decided we needed to escape for a little while; just a short break from all of it to play somewhere. A few weeks ago, the perfect deus ex machina appeared in the form of an email from Christie’s in New York, saying they’d like to have a look at my mother’s violin. I must digress a bit to share the history of this violin, which has been, for better or worse, a telling part of my family’s in-house folklore for my entire life. 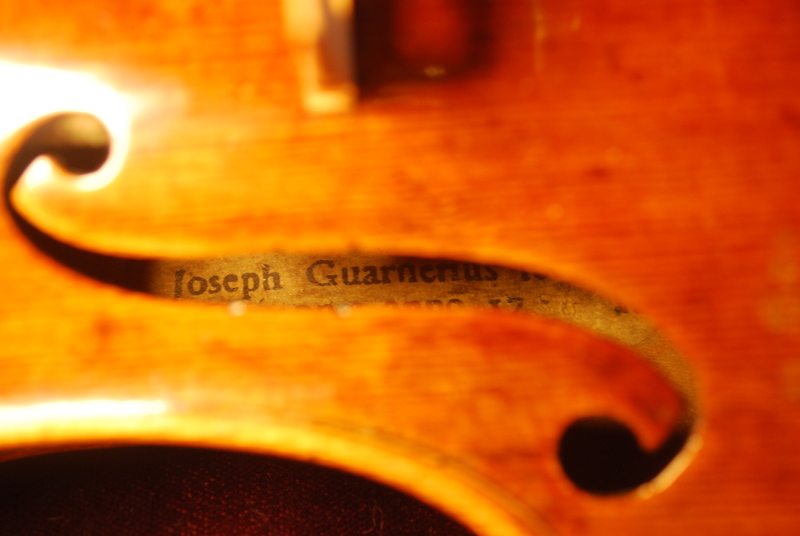 My mother insisted to all who would listen that it was at least a part Guarnerius, and always referred to it as “The Guarnerius”, showing anyone who exhibited the slightest bit of interest the tiny little label inside that said “made by Joseph Guarnerius, Cremona”. My dad, the guy with the actual, real, Ph.D. in musicology, always dismissed mother’s airs about the “fiddle” being some rare, priceless thing. “Yeah, sure, Shirley,” he would sigh; “we know at best it’s only a partial Guarnerius, don’t get your hopes up.” Even though the violin indisputably has this label, he would remind her that “we just don’t know enough about it, it could well be a fake, one of these days we should have someone really look at it definitively” (which of course he never did). But the violin repair people who HAD looked at it over the years, even casually, concurred that it was probably at most 1/4 or perhaps ½ a Guarnerius with a new neck and various other parts cobbled onto it over the centuries. It is, after all, an eighteenth century instrument; it has been around a long time. Clearly it has been damaged and repaired, so we know from the outset that chances are overwhelming that we aren’t going to have one of those Antiques Road Show moments where all the cameras are on you when it’s determined that your funky old treasure is actually worth hundreds of thousands of dollars. For decades, we all tolerated mother’s flights of fancy about the supposed staggering value of this instrument and basically ignored her inflated notions about it. We did know that it had been a wedding present to her from my paternal grandfather, George Steiner, also a distinguished composer and musician. The part of the story we thought was true, confirmed by my dad’s sister, was that George had almost certainly brought the violin with him to the United States when he emigrated as a very young man from Hungary, in the first decades of the 20th century. It wasn’t at all far-fetched to imagine that my grandfather, who had studied composition with Kodály and was first violinist of the Budapest Philharmonic at the age of 15, would somehow have come into possession of such a fine violin in the first place. Reconstructing the family history as best we can, as he was transitioning himself from the violin to the viola, giving the “Guarnerius” to my mom was probably a logical and very cool thing to do. As a young woman, (my dad was her accompanist when they were college students) she was a gifted violinist, a student at the Oberlin Conservatory, and if nothing else we figure George knew she would play the bejesus out of it, love it, and take good care of it, especially under my dad’s incredibly compulsive and watchful eye. The good news about the family history we know to be true is that it places the violin in our family throughout World War II, so at least we don’t have to worry that it was stolen from some family by the Nazis and would now have to be repatriated. And the “Guarnerius” did indeed, throughout the earlier part of its life in our family, see a great deal of use and even as a kid, listening to my parents and their friends play chamber music in our living room, I could tell this violin was quite wonderful, with a special sound. The fact that it happened to have a beautiful sound just fed my mother’s unwavering belief that it was indeed a real Guarnerius. Back then, it was indeed played and enjoyed; but as my mother grew older, frailer, sicker, sadly, it was increasingly relegated to life in its case. My dad obsessively put humidifiers and thermometers in there, to protect it, especially once they moved to the high desert climate of Santa Fe. But as something to make music with, its voice was heard no more. I found this all terribly depressing, being the sort of person who likes to see fine things be used for whatever purpose they were intended. With my mother now blind and immobile, incontinent and entirely bedridden, obviously her days of playing her beloved fiddle are now over, and Wendy, Arnold and I had a pow-wow about what to do with it. There wasn’t anyone in the family seriously studying violin, and certainly no one at a level that would merit a gift of this stature. No, we thought; our hope is that someone begins to play this thing again and bring it back to life — we need to sell it. Let some younger person have it, hopefully, as a thing that actually produces music instead of serving as a wannabe status symbol. And whatever we do get for it when we sell it, we’ll do something to remember Mom by – maybe all nip off to Venice, a place she loved more than anything, and raise a glass to her at the bar at La Fenice or order a fifty dollar plate of pasta at Harry’s in her memory. She would love that, too. So Arnold began contacting dealers in New York to see who might be interested; Christie’s asked us for a series of rather detailed photos, the taking of which made me decide that on our next trip I was going to update my camera (topic of another blog post!). I did my best photographing it just as they required, with special attention to that mysterious little paper label inside the f-hole. Not an easy job but good enough so that they got back to us and said “yes, we’d like to see it”. Soon thereafter we packed it up in its case and off we went. We had to hand-carry the violin with us onto the plane; for whatever it may turn out to be be, it is not the sort of thing one sends to Nueva York via Correos de Mexico in a box, or even via Fedex. As I mentioned above, in any event we were dying for a fall foray to Nueva York, and right after we got there we took the violin to Christies’, for our appointment with their fine instruments expert, which turned out to be utterly fascinating. They asked us, of course, to tell them what we knew about the violin, which we did, to the best of our ability. It occurred to me in the course of that part of the conversation that an unintended consequence of my dismissive attitude toward the whole business of my mother and her bloody violin over the years was that I never had the slightest interest in actually asking her – or my father – anything about it. Sad, because particularly my father, could actually have recounted in a trice how it had come into George’s possession. At the end of the day, It’s unfortunate that my impatience with my mother’s tendency to self-aggrandizement ultimately resulted in my failure to be able to add much in the way of factual history to the whole story of the violin which now lay, denuded of all its embellished attributes, under a fluorescent light on an examining room table at Christie’s. As though they were studying a patient on an operating table, they pronounced the label inside to be of uncertain origin “probably Dutch” (e.g. not Italian and possibly fake but maybe not); it has some sort of indeterminate catalog number and they need to figure out who catalogued it and when. And, they noted – that the entire instrument was warped and needed some serious repair work. Finally they said “it’s been played a lot, and it’s been played hard”. You could see what they were talking about as they pointed out every little flaw and crack and repair to you. It was actually totally cool. I thought “Poor little violin, now after decades of lying mute in a case, this may be the very first steps in someone beginning to actually play you again – just be patient, and soon this awful period of silence may be over….” Anthropomorphic, to be sure, and silly, but that’s what I felt. Well, they said, before we can properly assess its value for auction, here is what we’ll have to do to find out more about this instrument. “We would like recommend that it be sent to London for dendrochronology studies and then we’ll know what we have here.” It turns out that this is what they do with anything made out of wood where they’re trying to determine the age of the object in question. In the case of antique musical instruments, these experts in London can look at the wood patterns, analyzing the summer growth and winter growth, and they can match what they see to a database of hundreds of thousands of wood patterns to see, first of all, how old it really is. Then, they search for a match to the documented wood grain of any known Guarnerius violins. Because these workshops traded pieces of wood from time to time for use in specific instruments for various reasons, they also check against the woods used by other renowned violin makers of the time – Stradivarius, Del Gesú, Amati, and so forth. Apparently, these makers would just order up a whole tree, cut it into pieces, and age the wood – and use many pieces from the same tree or trees for various instruments, just as violin makers would today. These folks in London actually have a database of a certain set of trees on specific forest slopes in Austria that were favored by the makers of that time. So, if you get a match to the grain, voilà, you might actually have a real Guarnerius. Or at least part of one. We shall see. They also were interested in the two bows – seriously shedding hairs and obviously in need of some work – in the case. They even carted the bows off to a lab upstairs to be x-rayed and further studied. One of them may turn out to be valuable but there are mysteries connected with that as well – the pins are wrong to be from the maker the label says it’s from, and on it goes. Even at Christie’s, though, oddly enough, no one put bow to string to actually hear how it sounded. I guess it will have to wait awhile more before anyone gets serious about playing it. But, perhaps, in the lifespan of a thing that dates from the mid-1700’s, hopefully not too much longer. Anyway it was all fascinating and no matter what the outcome we will have learned a great deal! Too bad WE don’t get to take it to London, though. Well, there you have it…or something! Tab is eating her food AND Luigi’s food, we have to sort of feed them sequentially. That kitty’s eating disorders make me with my weight problem look like a rank amateur. She REALLY has a problem. Definitely kitty-shrink material. Tonight we are just going to let them all have the run of the house and see if we get any sleep at all. Rosie and Missoni will hide I am sure and be really upset at the loss of their preferred spaces on the bed. But I have this weird theory that we should try it because if Tab and Luigi can sleep with us it might ratchet down THEIR anxiety levels and make things calmer all around. Either that or it’ll be all out third world kitty war all night as they duke it out. My weird theory will probably turn out to be just exactly that – a weird theory – soon to be tossed onto the pile of other cat owners’ weird cat behavior theories that turned out to be -well, dead wrong. As they say, vamos a ver! Meanwhile the weather here is absolutely gorgeous, blue skies cooling off a bit, and big puffy clouds. We are awaiting the annual arrival of the snowbirds which marks the beginning of “high season” here – with all sorts of concerts, activities, charitable events. They stay until April and then when the spring rolls around, they all head back to Minnesota or Canada, sort of like flocks of geese. While they are here, though it’s lively, with restaurants and shops full, you can give up hope of finding a parking place in the village. But right now it is still calm; we are going to enjoy it while we can.